Activists in Brussels welcome the Turkish Minister of Foreign Affairs. Photo shared on Twitter by @@marianne_koch. A group of human rights defenders have been in jail in Turkey since July 5, after being arrested during a digital security and information management workshop on one of Istanbul’s islands, Buyukada. Their arrest was met with widespread condemnation from governments and institutions around the world, and by fellow human rights defenders on social media. Wir sind der festen Überzeugung, dass diese Verhaftung absolut ungerechtfertigt ist. Wir werden seitens der Bundesregierung alles tun, auf allen Ebenen, um seine Freilassung zu erwirken. We are firmly convinced that this arrest is absolutely unjustified. The German government will do all it can, on all levels, to secure his release. We regard their detention as excessive and illegal. In each case, we have had to fight for consular access, which is a right guaranteed under international law…. things cannot go on this way. We cannot continue as before. We need to be clearer than we have been so that those responsible in Ankara understand that this type of policy will have consequences…. 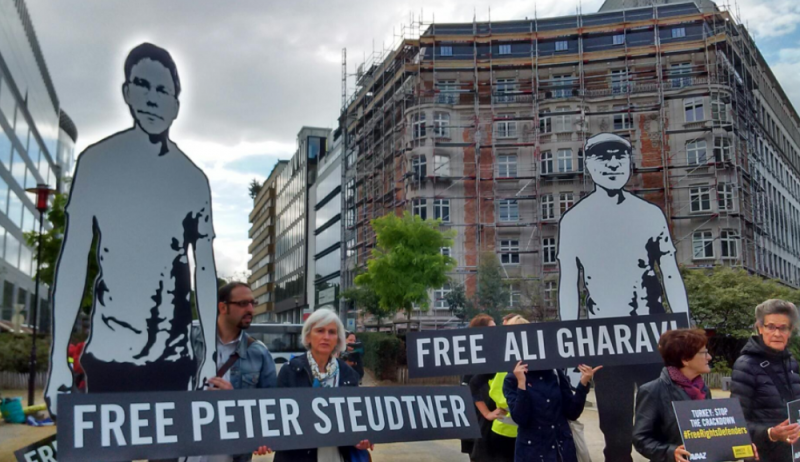 We demand the release of Peter Steudtner, Deniz Yücel and Meşale Tolu, unlimited consular access, and swift and fair trials for them and the other Germans accused of political crimes. It is our opinion that Gharavi was in Turkey to attend a peaceful seminar on internet freedom and human rights and we have urged Turkey to quickly clarify the grounds for charges against him. The EU expresses its serious concern over these arrests, one month after the detention of the Chair of Amnesty International in Turkey, Taner Kiliç. It echoes the concerns expressed by Nils Muižnieks, Human Rights Commissioner of the Council of Europe, that “the use of criminal proceedings against human rights defenders for conduct that should be protected under the European Convention on Human Rights is unfortunately an increasingly frequent phenomenon in Turkey. In a press briefing, the European Commission called for the “immediate release” of the group, calling the detentions part of a “deeply worrying pattern” of imprisonment in Turkey. I accordingly call on the Government of Turkey to immediately release the arrested women’s rights and human rights activists and to provide its support to those, like women’s human rights defenders, who work for the good of their societies. We continue to urge the Turkish authorities to uphold international standards with regard to the rule of law, including the presumption of innocence, and to protect fundamental rights including freedom of expression and assembly. British MP David Lammy pointed to the persistent lack of evidence to support the charges against the group in his open letter, published on July 14. On social media, people continue to share links calling for their freedom, including a petition from Amnesty International which has nearly 25,000 signatures, using the hashtags #FreeRightsDefenders, #Istanbul10 and #HakSavunucularınaDokunma. Amnesty International has organised protests across the world, from Kyiv to Paris, Brussels, Kathmandu, and many more cities worldwide. Learn more about the detained human rights defenders, and sign the petition to support their release.